Reclaimed wood, marble, and stainless steel touches make up the material palette of this Austin kitchen. The dining table benches are from RAD Furniture. Plush De La Espada bench seats create a comfortable dining evironment in a home near Lake Tahoe, California. 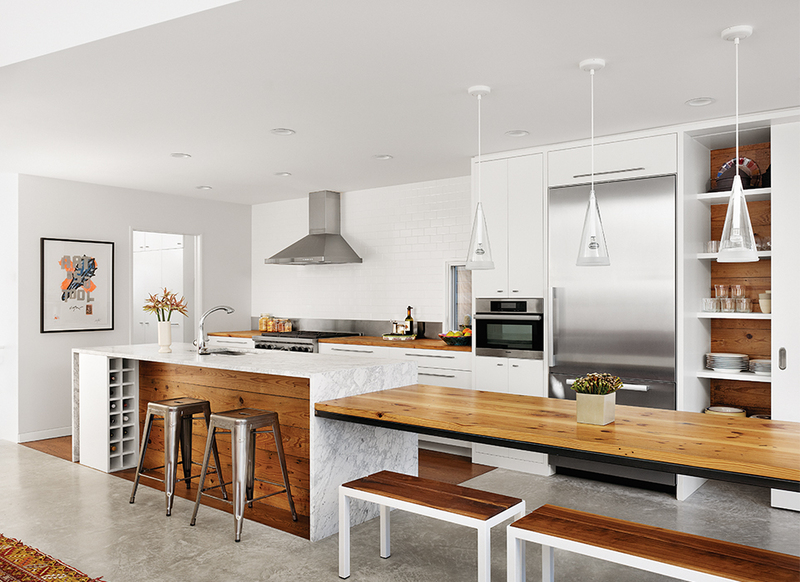 Ligne Roset’s Eaton table and bench complement a largely walnut kitchen in San Francisco. In an outdoor dining area in a Palo Alto residence, the patio table and benches are from Crate and Barrel. The Half Full table and bench by Ross Gardam complement the indoor-outdoor nature of this bungalow in greater Melbourne, Australia.